The August EP650 Bluetooth Headphones have always prided themselves on the combination of comfort, style and convenience with a sound quality that demands to be heard. After years of being a leader in the Bluetooth headphone market, the EP650 has been rejuvenated with the introduction of a new chipset, including Bluetooth 4.2 and aptX LL technology upgrades. 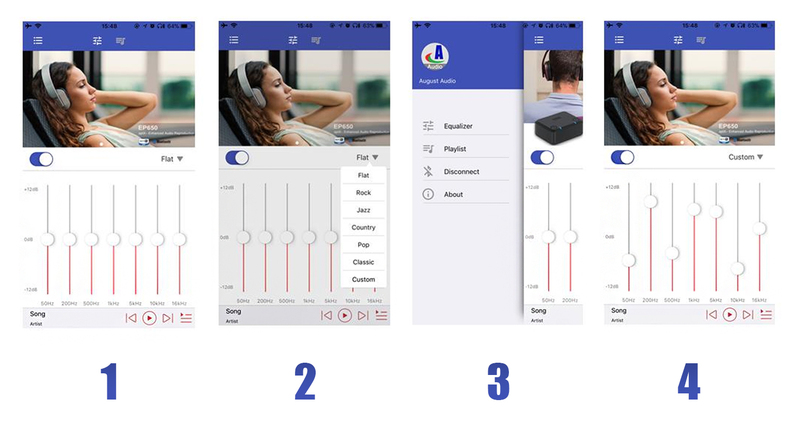 The rejuvenation goes further with the introduction of the ‘August Audio App’, capable of tuning the chipset and the improved battery life of up to 15 Hours! Under the Bluetooth 4.2 standard, the data transmission speed between devices is around 250% faster. In addition, security enhancements have been made, including the additional benefit of allowing only trusted owners to track device location and confidently pair devices. Bluetooth 4.2 devices can directly access the Internet through IPv6 and 6LoWPAN, and support low-power IP connectivity. The purpose of aptX Low Latency is to ensure that Bluetooth enabled devices audio is in sync with video. The introduction of aptX LL reduces latency and improves the users experience by improving end-to-end audio transmission speeds. This technology allows you to enjoy wireless media in complete sync. This makes the EP650s perfect for those nights where you want to enjoy your movie or gaming session to the fullest, but don’t want to wake the entire house up! The introduction of a new chipset allows users to have full customisation of the EP650s. For android users, the chipset can be directly tuned, affecting the Bluetooth headphones EP650s when paired with any device. When opening ‘August Audio’ the user can directly alter the EQ manually, or choose from a wide selection of presets. The app also contains a music player, allowing you to play music directly from your device, without the need to change to a 3rd party music player. Adding to this, the capabilities of the application extend to turning off and on the EP650s blue LED. Whilst the iOS version of the application is unable the directly affect the chipset, due to limitations of the operating system, users can still use the application as an EQ and music player application. If they have an Android device, they are able to make the changes they wish and return back to their iOS device. The image above shows the application in use, such as the ability to change the EQ using presets, playing music via your library and a custom EQ in use. Check out the new Application Enabled August EP650 here. aptX HD – lossless or lossy?